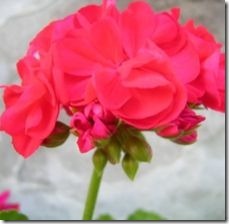 Vibrant colors, showy blooms and variety of choice make geraniums a ubiquitous garden favorite. Identifying and preventing the bugs that feed on these beauties can save the life of your plants and the look of your garden. "Annual geraniums tend to be bug-resistant," nursery owner Heather Flatters said in an interview, although some varieties attract specific bugs. Flatters said her nursery avoids growing the Martha Washington geranium because "it’s prone to whitefly problems." The website Floriculture Greenhouse Update recommends inspecting ivy geraniums for spider mites. Other bugs known to bother geraniums include aphids and caterpillars. A sticky residue on foliage is the calling card of aphids and whiteflies. Aphids also shed a whitish skin. Tiny whiteflies congregate on leaf undersides and excrete "honeydew" on top. A black mold forms on whitefly honeydew. Mites are more visible on upper leaves, which appear speckled. Fine webbing on the plant indicates a strong mite infestation. Caterpillar larvae are detectable at dusk and attack the buds. Bug infestations affect leaves and buds. Chewed petals or buds that fail to bloom mean a caterpillar problem needs to be "nipped in the bud." The foliage of a mite-infested geranium is discolored and mottled. In bad cases, the leaves appear scorched and fall off. With aphids, the leaves deform and curl. Whiteflies, in small number, feed on a few leaves, but a large infestation can kill the entire plant. Prevention is the key to protection. Before buying annuals, inspect leaf undersides and buds and choose healthy-looking plants. Planting garlic or marigolds nearby helps repel aphids and whiteflies before they become a problem. Regular inspection of the leaves, new buds and growth for underlying bug problems is a good deterrent. Caterpillars, if caught early, are best controlled by picking them off at dusk. Mites tend to dissipate after a rainfall, so a strong weekly spray of water on the foliage underside and lower part of the plant should remove them. Insecticidal soap sprays may work for aphids and whiteflies, but it’s always wise to consult with a local nursery. Horticulturist Sherry MacDonald said in an interview that the perennial geranium, as an herb with a strong fragrance, helps repel certain bugs and pests. MacDonald uses border plantings of perennial geraniums as "a natural deer repellent, and it works," she said. "The deer hate the smell." According to the Gardens Ablaze website, perennial geraniums offer protection against corn earworm and imported cabbageworm, and the white geranium is said to repel the Japanese beetle. Rubbing the leaves of a mosquito geranium, an annual, produces a citronella scent, although the plant’s efficacy as a mosquito repellent is unproved. 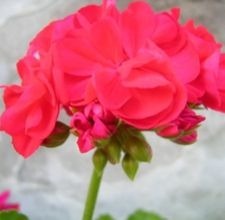 « What Are the Benefits of Geraniums?